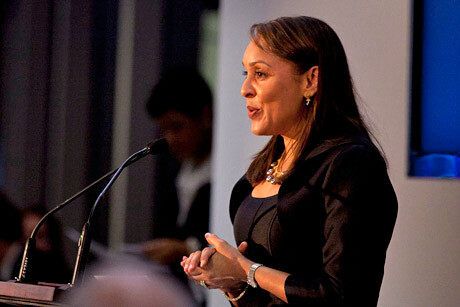 Natasha Trethewey, Robert W. Woodruff Professor of English and Creative Writing, is the 19th U.S. Poet Laureate. "Poetry is a source of vibrant energy on the Emory campus, in large part due to Natasha's brilliance and commitment," says Robin Forman, dean of Emory College of Arts and Sciences. "This is a wonderful moment not just for Natasha, her friends, family and colleagues, but also for the hundreds of students -- undergraduate and graduate -- whose lives have been enriched by the opportunity to learn from her." Emory professor Natasha Trethewey begins her term as the nation's 19th Poet Laureate with a Sept. 13 reading at the Library of Congress in Washington, D.C.
Natasha Trethewey and Rosemary Magee, director of Emory's Manuscript, Archives, and Rare Book Library, examine the creative process and poetry's special role in public and private spaces.